The CW has released a promo for "The Devil's Greatest Trick", next week's episode of Arrow. The episode will see Team Arrow dealing with the fallout of this week's plotline, which saw Vincent Sobel/Vigilante (Johann Urb) being killed by Cayden James' (Michael Emerson) team of villains. As Cayden ups his attacks against Star City, Dinah Drake/Black Canary (Juliana Harkavy) will go on her own quest for revenge, which will apparently involve making Laurel Lance/Black Siren (Katie Cassidy) a target. Meanwhile, Oliver Queen/Green Arrow (Stephen Amell) will try to balance his vigilante duties with fatherhood, as William will be asking for more of Oliver's time. "My first day on the show this year was four scenes with Jack [Moore], who plays Williams," Amell told reporters late last year. "I was f---ing nervous. I was really, really nervous. I had never done a scene with him before and, reading episode 601, I'm like, 'Oh God.' In my mind, this entire episode hinges on us having good on-screen chemistry and Jack was not only equal to the task but excelled. So Oliver being a dad, it's certainly been my most fun thing to play." You can check out the official synopsis for "The Devil's Greatest Trick" below. 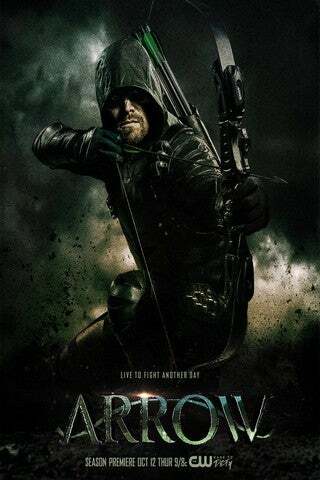 Cayden James (guest star Michael Emerson) discovers a secret about the Green Arrow (Stephen Amell) that pushes him over the edge. Knowing everyone and everything he loves is in danger, Oliver must decide if he can do this alone or if he needs to turn to his old teammates for help. William (guest star Jack Moore) starts to demand more of Oliver’s time. JJ Makaro directed the episode written by Sarah Tarkoff & Emilio Ortega Aldrich.